Een suikervrije Dentyne Pure chewing gum met een subtiele meloen smaak. 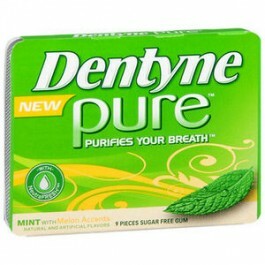 Dentyne Pure zorgt voor een frisse adem. Maltitol, Gum Base, Sorbitol, Natural and Artificial Flavoring (Including a Blend of Natural Botanical Extracts [Neutralizes Bad Breath Odors Caused by Bacteria and Food]), Maltitol Syrup, Erythritol, Less than 2% of: Acesulfame Potassium, Aspartame, Blue 1, Candelilla Wax, Gelatin, Glycerin, Soy Lecithin, Sucralose, Titanium Dioxide (Color), Xylitol and Yellow 5.